Luckily we all love fruit based snacks, such as raisins and covered raisins however I can often struggle with what to give Jack without giving him the same items every single day. Recently we were contacted by Fruitbowl asking if we would like to review some of their snacks. Who were we to refuse as I often purchase their Yogurt Raisins for Ashley. Generally, this is the only item I would normally purchase from their range as I knew we liked these but wanting to try some new snack ideas we were keen to try other products. 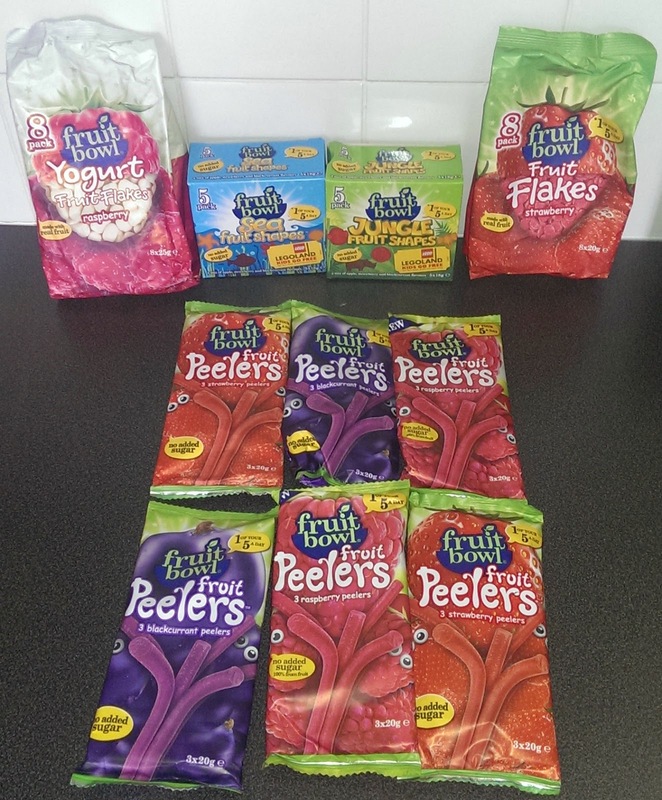 Within our package we received a whole range of products including fruit peelers, fruit flakes, yogurt fruit flakes and fruit shapes. Fruit Peelers. These come in three fun flavours strawberry, blackcurrant and raspberry. They are made with 100% fruit and have nothing artificially added. They are simply your favourite fruit made into fun, peelable strips. Within each pack is 3 20g peelers which each count towards 1 of your 5 a day. 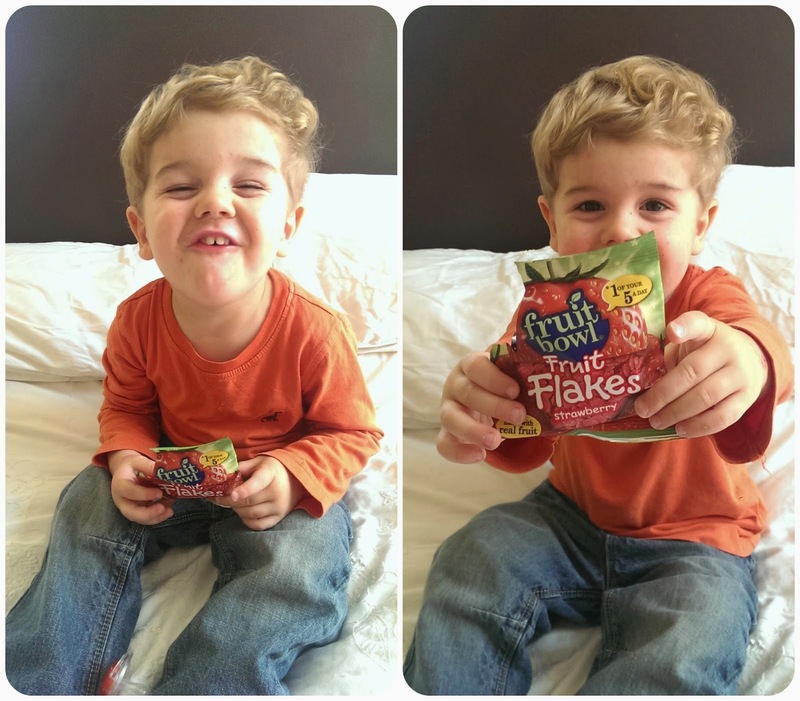 Fruit Flakes. Coming in four different flavours blackcurrant, tropical, raspberry and strawberry these snacks are low in fat containing only natural colours and flavourings. Each pack is equivilant to on your children's five a day. Yogurt Fruit Flakes. Made similarly to the fruit flakes, however are covered within real yogurt. Coming in three flavours raspberry, blackcurrant and strawberry. Fruit Shapes. These fun fruit shapes come in two different types sea and jungle shapes. With no added sugar and natural colours and flavourings these shapes are made simply with apple, strawberry, pear and blackcurrant natural fruit juices. One of these packs is equivilent to one of your child's 5 a day. As a family we have all really enjoyed the different Fruitbowl snacks in which we were sent. Jacks favourite were the fruit shapes, which all went first whilst Ashley and I didn't have a particular favourite although I did find the peelers a little sweet. These have been perfect for a snack for Jack throughout the day or to take out and about with us, whilst also being perfect for the lunchbox too. We would definately recommend these products to others. Please Note: We received these products free of charge yet all wording and images are my own and not influenced.